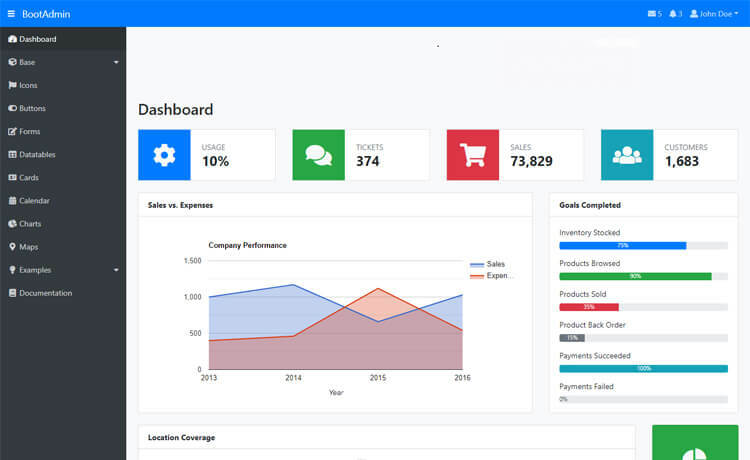 BootAdmin is a free HTML5 Bootstrap 4 admin dashboard template. Scatter, Column, Area and Pie charts are also included in the package. Data table, Cards, maps, calendars, and Font icons are some of the handy options BootAdmin brings. BootAdmin is a free HTML5 Bootstrap 4 admin dashboard template. It is a perfect theme for web app backend, control panel, admin panel, etc. BootAdmin is fully responsive and built following all the latest web technologies and rules. Moreover, it has a simple look with a sophisticated design. Tons of useful features are also laden with BootAdmin like progress, modal, tooltip, drop-down, navs, collapse, lists, popovers, tables are few from them. BootAdmin comes with example pages like blank, pricing, invoice, FAQ and log in. Scatter, Column, Area and Pie charts are also included in the package. Data table, Cards, maps, calendars, and Font icons are some of the handy options BootAdmin brings. It is effortless to create with BootAdmin because of it’s easy to edit code. Thank you for downloading BootAdmin. Here are three recommended free HTML5 Bootstrap 4 admin dashboard templates.